The Prankster previously blogged that the British Parking Association are attempting to change the terms of the appeals process by only adjudicating on a single point. Although the BPA are attempting to claim all other points have been adjudicated on, they have no credible proof of this. In fact this is an impossibility for many cases because the operators have not yet filed evidence packs, so there is nothing to adjudicate on. 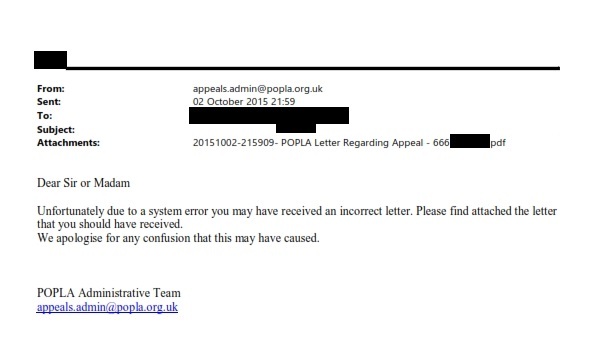 In at least one case the BPA have admitted by email that the case was not fully adjudicated. Ironically, their own actions may invalidate the parking charge, even if all other points are later considered (eg by a court) and would have been found in the operators favour had not the BPA intervened. Under the provisions of the PoFA in order to claim keeper liability the parking company has to comply with certain conditions. One of those conditions (7.2.d or 8.2.g or 9.2.g) is to serve a notice which must “inform the driver of any discount offered for prompt payment and the arrangements for the resolution of disputes or complaints that are available.” In all of those 4000 cases that will have taken place. However, if the arrangements have altered, because the BPA has changed them, the keeper can then argue that the parking company cannot pursue keeper liability because the arrangements are not the same as those disclosed. 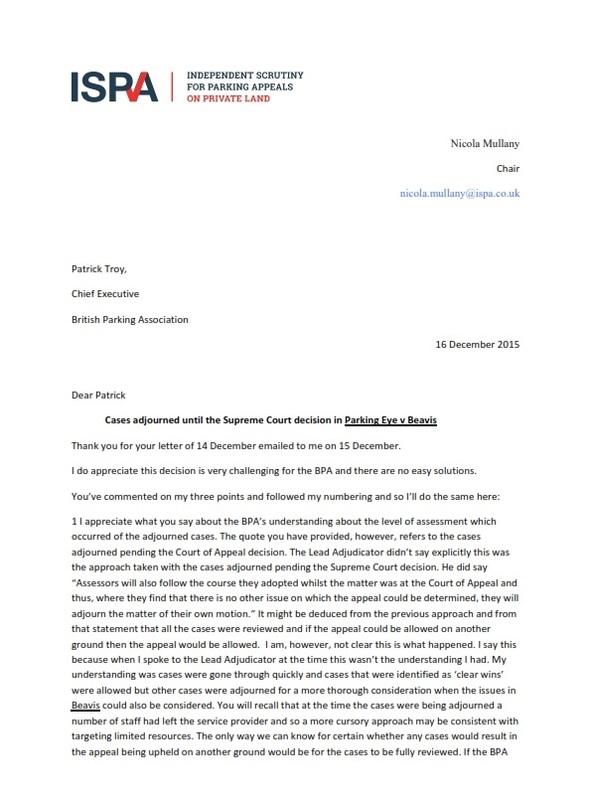 If you have a stayed case at POPLA, it may be worth you writing to the parking company. 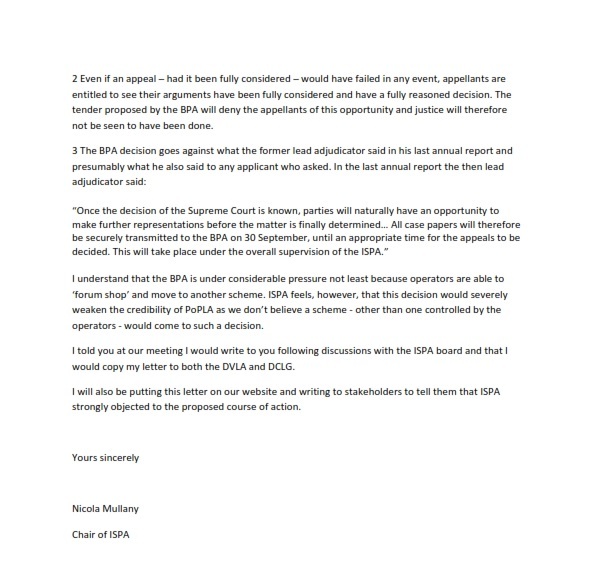 I understand that the BPA is considering changing the arrangement for the resolution of my case currently under appeal. If this occurs, then as the arrangements for the resolution of disputes or complaints that are available to me are different to those set out in the notice you served on me under paragraph [7(2)(d)/ 8(2)(g)/9.2(g)] of Schedule 4 of PoFA then you have not complied with that condition and as such you will then be unable to pursue keeper liability. I expect you to formally withdraw your claim in such a case, as you will no longer have a cause of action. I understand that you are considering changing the arrangement for the resolution of my case currently under appeal. If this occurs, then as the arrangements for the resolution of disputes or complaints that are available to me are different to those set out in the notice served by the operator on me under paragraph [7(2)(d)/ 8(2)(g)/9.2(g)] of Schedule 4 of PoFA then they will have not complied with that condition and as such will no longer be able to pursue keeper liability. I therefore wish to add this as an appeal point in my case. Please confirm that this has been added and will be considered by any assessor. In 2011 an impact assessment was undertaken by the government to help decide whether to introduce a law regarding keeper liability. That impact assessment is available online here, and comes up for review in January 2016. In this blog The Prankster takes a look at the impact assessment in light of the data available since the keeper liability act was passed. Of these, only the first and last (ParkingEye and Euro car parks) use the keeper liability legislation. The others all issue deliberately non-compliant notices to keeper and do not use keeper liability legislation; they pursue the keeper on the basis that they are likely to be the driver. If 3 of the top 5 parking companies do not need the keeper liability legislation, the big question is whether the legislation is needed at all? We do not believe that this change would increase costs to government. Parking companies would have a one-off cost to amend signs/paperwork and to set up an independent appeals service. There would also be annual costs thereafter to fund the independent appeals service. The annual cost of an appeal service was estimated at £0.6m. This appears to be an underestimate. The BPA currently have a disagreement with London Councils over an apparent £180,000 amount still owing, and of course there are two appeals services as the IPC have entered the sector. A reduction in the number of complaints/appeals where the defence is that the keeper of the vehicle was not the driver at the time. An increase in the number of tickets being paid. This has not been costed as the rate of increase is unknown. The number of appeals where the defence is that the driver is not the keeper may have decreased, but other appeal reasons are equally valid. 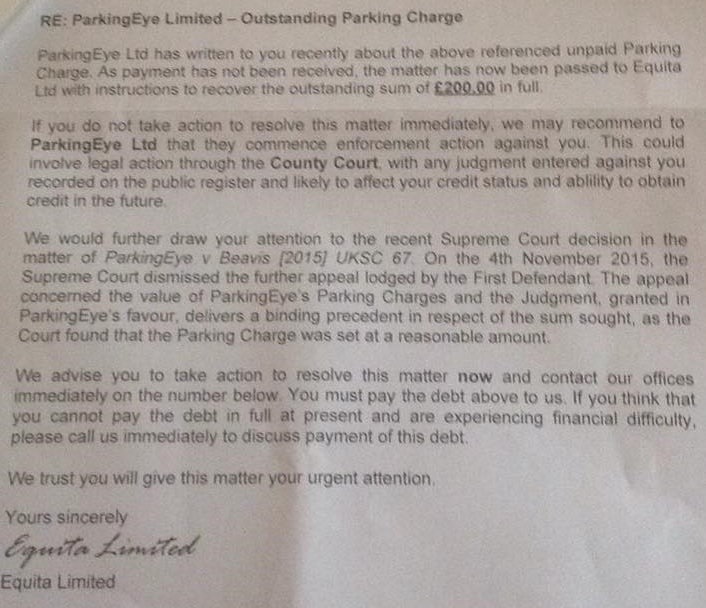 Data which ParkingEye filed in court admits they issue 65% of tickets in error. A further 45% of tickets are then cancelled by the appeals body, POPLA. It appears then, that most tickets are issued without a valid reason. Reductions in administrative burdens on DVLA due to fewer claims being processed from the issue of parking charges (costs to DVLA are recovered via the fee charged for providing vehicle keeper information). In 2010/11, the year before POFA 2012 started, Parking Companies made 1,178,034 keeper enquiries. In 2014/15, Parking Companies made 3,083,276 enquiries. In the 6 months April-September 2015, Parking Companies made 2,273,254 enquiries, or an extrapolated 4,546,508 enquiries per year. So, the legislation has increased the burden on the DVLA fourfold. The impact assessment predicted that the number of extra tickets issued would only be 500,000. The DVLA are not too unhappy about this. At £2.50 a pop, this represents substantial income to the DVLA. Senior members of the DVLA have KPIs which depend on this income, so in effect they are financially benefiting by allowing this to continue. The DVLA attempted to erect a smokescreen about this and told the Government it costs £2.80 to process an enquiry, so actually they made a loss. However, The Prankster can reveal this is an accounting trick The DVLA have stonewalled a number of FoI request to find the true costs, but eventually the figures have been prised from their grasp. This biggest category is LA/TfL/Police/Gov who made 10,200,707 enquiries (56.7%) but pay nothing. The DVLA are therefore using the parking company income to subsidise other services and are artificially inflating the parking company costs to try and justify this. may have a clearer understanding of their responsibilities. Enables landowners to effectively enforce parking charges. service, which in turn would benefit the Criminal Justice System. "The BPA has said that of the 1.8 million parking charges currently issued each year around 2-5% (36,000 to 90,000) of cases are taken to civil court per year. Court costs are not expected to increase 10 and have not been forecast because keeper liability will not be brought into force until an independent appeals service is operating throughout the country. " In fact this was false information provided by the BPA. Only 845 cases were filed that year, of which 49 went to a hearing. This can be contrasted with data from 2014 from the MoJ, which shows that over 37,000 claims were issued; ParkingEye issued 30,309 of these. The number of tickets issued has massively increased from 1 million a year to over 4 million. If all these were paid at a discount rate of £60, this would result in £240 million being taken out of the economy each year to line the pockets of parking company bosses. This is money which shoppers will no longer spend in the shops and so is a blow to high street retailers. This charge level is also a serious concern to pensioners and other vulnerable members of society - the people who are most likely to fall foul of the parking companies. As this is most of the weekly pension it leaves pensioners struggling to pay for food rent and heat, all because they are too slow and frail to shop as quickly as able bodied people. The key question is; has the number of tickets increased because motorists have become much more badly behaved, or is this because parking companies have introduced ingenious schemes which are hard to obey so they can milk the motorist? The answer is obvious. The Parking Cowboys website 2015 survey shows that most tickets are issued to genuine customers overstaying at retail parks. There is no evidence that this enforcement results in a benefit to retailers. After all, genuine customers staying longer means they buy more things. Some retailers have even been forced to take action due to the drop in sales - both Somerfield and B&Q fired ParkingEye because of their aggressive parking enforcement hit business. It turns out that the money which can be generated from a car park depends on how it is managed. Car Parks such as Bristol Eye Hospital are well managed; almost all motorists obey the regulations, and only a few fines were issued over a 4 year period. In contrast ParkingEye have introduced ingenious ways of milking motorists which allowed them to issue over £1 million of parking charges at one hospital trust alone. The way this is done is by making it difficult for motorists to know exactly how much to pay, by allowing incorrect numberplates to be entered, and by providing poor and confusing signage. Analysis of a typical ParkingEye car park shows entrapment zones where signage coverage is poor. This gives the car park the air of responsibility while ensuring a steady stream of victims. Rectifying these defects reduces the number of parking victims to almost zero; but this does not fit in with their business model. Parking management is needed, but allowing parking companies to operate systems which incentivise them to issue as many tickets as possible has led to a massive outbreak of abuse of power in the last few years. Is this what the impact assessment envisaged? How should this matter be addressed? 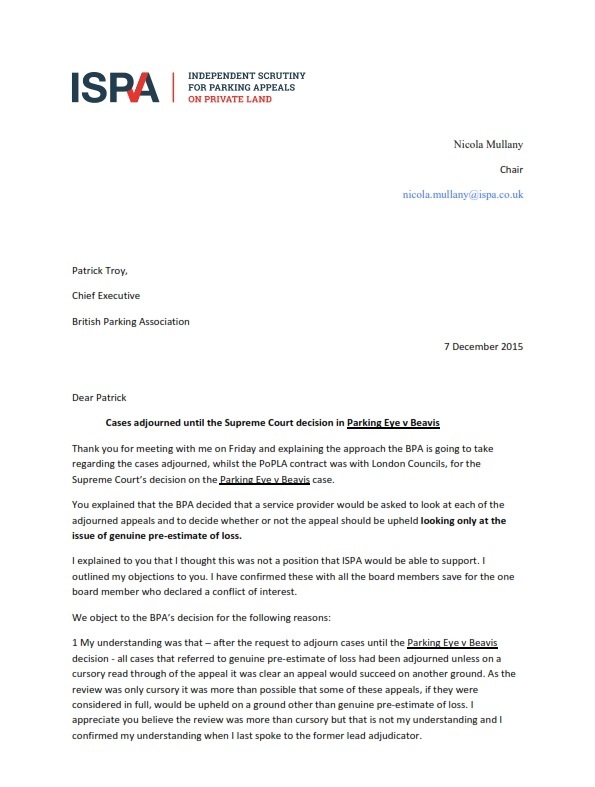 Can motorists take action against the British Parking Association for failing to provide a proper appeals service? Unlawful Interference with a contract? Tort of Conspiracy to injury by unlawful means? In a recent blog the Prankster pointed out that the BPA were trying to change the appeals process for 4,000 motorists. The BPA were trying to restrict the grounds on which the appeal was to be decided to a single point, that of the level of charge. To do this, they tried to pretend that all other points had been considered even though they had no written evidence to back this up and they knew this was not true from information provided to them by motorists. The most telling information of course, it that evidence packs have not been filed by the parking companies. The question then arises, is there a case of Unlawful Interference with a contract, or perhaps even Tort of Conspiracy to injury by unlawful means? If either of the above actions are taking place, there may be a claim available to any motorist awaiting the settlement of his/her appeal. There may also be a breach of the Consumer Protection from Unfair Trading Regulations 2008 for which, perhaps Trading Standards should investigate. It is clear that often there is a contract between a parking enforcement company and a motorist when that motorist parks. What of the terms of that contract though? Do they include a term that the motorist can apply to POPLA for arbitration? Beavis indicates, quite rightly, that the terms of the Code of Practice do not form part of the initial contract but compliance with the CoP is an indication of fairness for the purposes of Consumer Protection law compliance. Is there another contract though? Once a demand has been made for the parking charge, if it is not paid, the parking company can sue for the breach of the parking contract. It seems that what actually takes place when the demand for the parking charge is made is that the parking company indicates to the motorist that “if you wish to dispute the claim I will see you in court. However, in consideration of you agreeing to enter into an ADR arrangement to settle our dispute, and to consider the arbiter’s decision, I agree to waive my rights to pursue you via litigation”. Both parties agree to consider the arbiter’s decision - if the parking company loses it cancels the debt; if the motorist loses and fails to abide by the arbiter’s decision the parking company can sue. Thus there are three stages to this parking process and each has its own distinct legal nuances. This argument of a new contract where arbitration is agreed is given weight by a change in the 2008 Regulations which took effect from the 1st October 2014. The Consumer Protection Amendment Regulations 2014 amended the definition in the 2008 Regulations of a “product” such that when the parking company demands damages and agree to settle at £100 a “product” is offered to the motorist which is the purchase of “the settlement of actual or purported liabilities” (the product). That is what the 2014 Regulations now say. Thus there is a consumer contract, under the 2014 regulations when the parking company and the motorist agree on how to deal with the acquisition of the “product”. So, the parking company and the motorist have entered into a contract in relation to a “product” and the terms of that contract are clear in relation to the agreed terms of reference for the arbiter. The BPA is now seeking to unilaterally change the terms of that contract. Thus it is arguable that it is seeking to interfere in a contract to which it is not a party and which, on the face of it, appears to be a tortious interference with a contract and for which it could have a liability in damages. We know from the Beavis decision that a defence at arbitration that the claim is not a genuine pre-estimate of loss is likely to fall on stony ground, especially in the case of a free car park. However, Beavis was only concerned with the quantum of damages and not the actual liability for damages. That had already been agreed at an earlier hearing. Thus a motorist may have any number of other valid defences to a claim e.g that the signage does not specify that there is a liability for damages; that the defendant did not own the motor vehicle and was out of the country at the time of the parking event; that the car park was visited twice. It appears clear that, if the arbiter is to reach a decision on liability solely on the grounds of the relevancy of a GPEoL, the motorist could be prejudiced. Further, that the BPA is seeking to engineer a situation whereby the motorist will undoubtedly be found liable such that it can be argued that the BPA is deliberately trying to cause a financial loss to the motorist. 1. The BPA had knowledge of the contract – it is difficult to argue that it doesn’t! 2. The BPA has offered an inducement to bring about a breach of contract. Clearly a decision based solely on GPEoL and in ignorance of other defences put forward by a motorist will have a benefit to a parking company. The parking company’s silence suggests that it is in agreement with the BPA’s conduct such that an inducement could be found by a court. 3. The contract was breached causing loss. At the moment there is an unwillingness by IPSA to travel the road suggested by the BPA. However, the building blocks appear to be in place to leave the BPA with a liability in tort for a loss if the terms of reference are altered. The parking enforcement company would also have a liability as it would be in breach of its contract with the motorist. That could give rise for a claim for costs against the parking enforcement company if it then proceeds to litigation. Imagine – a parking company awarded damages of £100 but told to pay the motorist costs at £19 per hour of his time (litigants in person rate) and which could easily be in excess of £200. So, there may well be an arguable case for the BPA to answer. Then we have the Consumer Protection from Unfair Trading Regulations 2008. Regulation 5 makes misleading actions unlawful. Presumably parking companies are in agreement with the conduct of the BPA and are, through the BPA, seeking to change the rules under which they agreed to proceed to ADR. Has it committed a misleading action? Perhaps the manipulation of the ADR rules to benefit the trader amounts to an aggressive practice and perhaps at a criminal level. Has the BPA considered this? Should this whole sorry saga be reported to Trading Standards? Then there is Regulation 5(3) (b). Altering the terms of reference of the arbiter, after the arbitration process has commenced, is at odds with the Code Of Practice. Where a parking enforcement company fails to comply with the requirements of a CoP it is a breach of regulation 5(3) (b) and leaves a potential civil liability. An interesting can of worms. Perhaps BPA it is time to stop digging? Any motorist considering taking action against the BPA or a parking company should of course seek legal advice on their own case, as every case is different and will turn on the facts of that particular case. 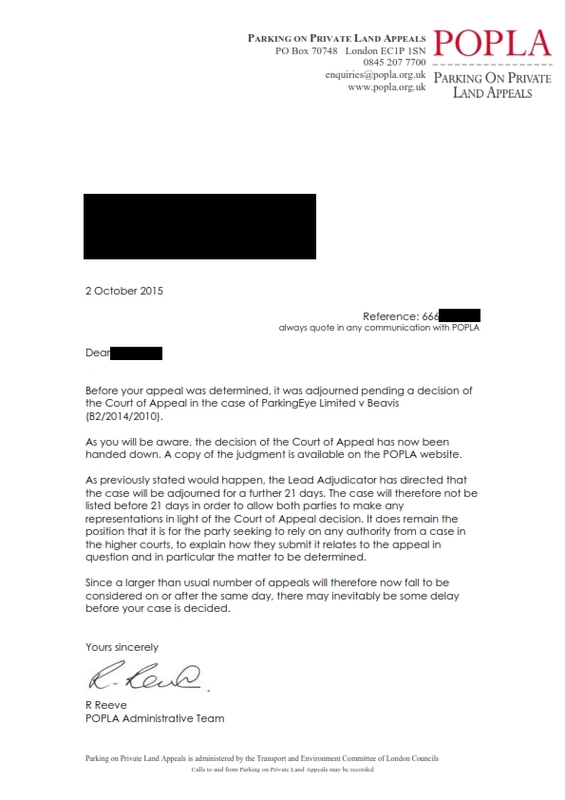 Shortly before the Court of Appeal heard the ParkingEye v Beavis case, ParkingEye wrote to POPLA asking that all cases which depended on the charge not being a genuine pre-estimate of loss be stayed pending the judgment. Henry Michael Greenslade, the Lead Adjudicator of POPLA, agreed, and a number of cases were stayed. The Court of Appeal judgment came out and it was almost immediately appealed further to the Supreme Court. 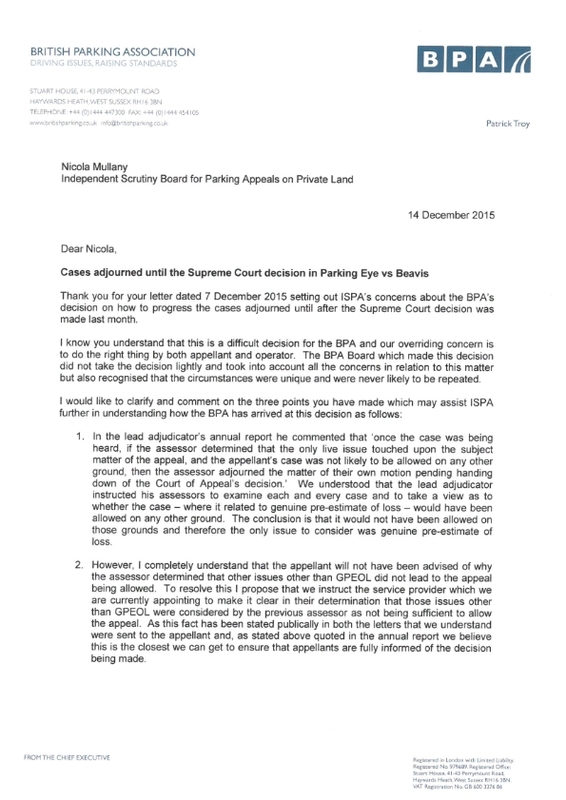 In line with normal practice for statutory parking appeals the stay remained until this new judgment was available. Mr Greenslade wrote to all stayed cases explaining that they would by held over until at least November 2015. POPLA then changed hands from London Councils to the Ombudsman Services and at the time of the changeover there were around 4,000 stayed cases. As the British Parking Association had omitted these from the tender, Ombudsman Services politely refused to take these on. The Prankster has previously analysed the invoices London Councils sent to the BPA, showing that the average cost per appeal was initially around £140. After the service had been running for a while, this fell to around £117. Analysis is further complicated by the fact that London Councils now want to charge the BPA an extra £200,000, which the BPA are disputing. The BPA now had to find a a way of getting the stayed cases adjudicated, and decided to tender out to yet another party. On the previous analysis the cost of getting these cases properly adjudicated will be around £120 per case; the BPA would be better off paying the parking companies £100 and pocketing £20. A slightly farcical set of emails were sent out in the last days of the old POPLA. These were intended to convey the message that the stayed cases would be held at some time in the future, but the wrong email was sent out. This was hurriedly corrected and a fresh batch of emails sent out. The letter is clearly designed to give the impression that an assessor has looked at the case, and decided that the only matter outstanding is the issue of the level of charges. However The Prankster can confirm this is not true. The Prankster has been made aware that in a large number of cases the operator has not yet filed an evidence pack. This is particularly true of ParkingEye cases. The assessor cannot therefore possibly have made an assessment on issues such as whether keeper liability applies, whether signage is sufficient in quantity or wording, or whether the operator has authority to issue tickets. These are all areas which have been raised in the stayed appeals, and points with which companies such as ParkingEye have lost appeals both with the old POPLA and the new POPLA. The Prankster would therefore normally expect that either the British Parking Association would allow all such appeals on the grounds that the operator has declined to defend the case. The British Parking Association contract with POPLA, signed on 23 December 2013, explicitly states that all operator evidence packs must be filed within 28 days. It would seem therefore that the operator has already been timed out and should not have the right to submit an evidence pack. After all, if the operator is claiming a charge for an overstay of 30 minutes on the part of a motorist, then an 'overstay' of 7 months on the part of an operator is a far greater transgression. However, as the British Parking Association is a trade association for operators they might well be lenient on this point and allow the operators to submit an exceedingly late evidence pack. The POPLA contract then allows the motorist to send a rebuttal, which should be communicated to the operator. However, this appears not to be the tack that the BPA are taking. 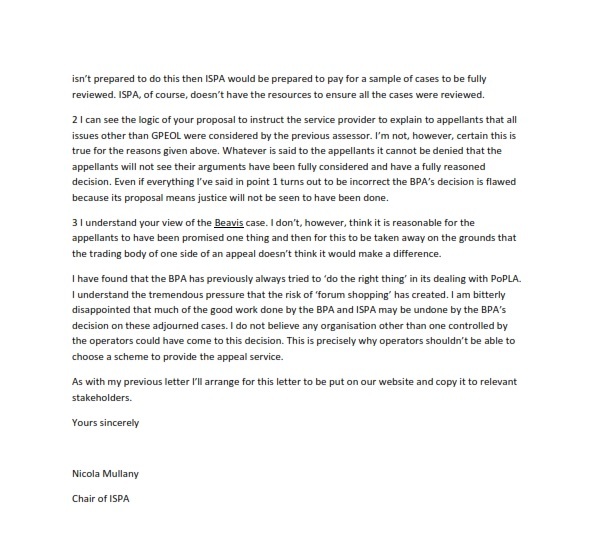 According to letters between the BPA and the POPLA scrutiny board ISPA, the BPA have gone for the nuclear option and have decided to save money by not having the outstanding cases fully adjudicated on all points. They have decided to tender to get the cases decided purely on the issue of charges. ISPA are firmly against this. Here is their first letter to the BPA. The letters are also hosted on the ISPA home page. 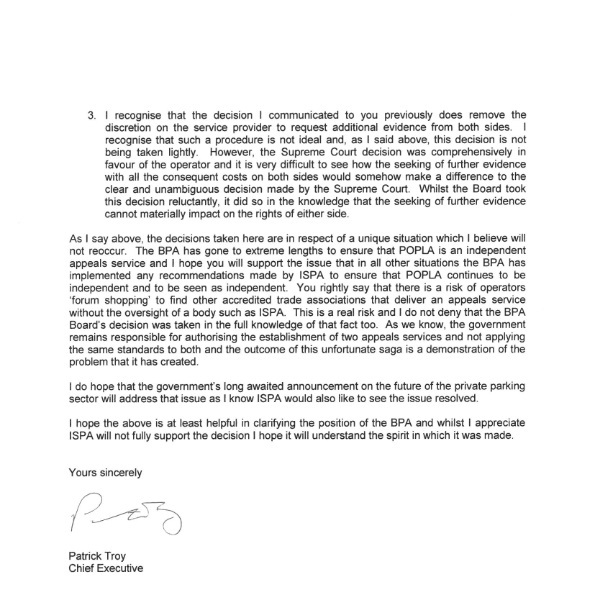 Here is Patrick Troy's response from the BPA. And here is the ISPA's response. The Prankster believes that Patrick Troy does not understand the significance of the Beavis case and how the law works. Although he states the decision 'was comprehensively in favour of the operator' this is of course purely based on the facts of that case. Other parking cases have different facts, and applying the guidance of Beavis will come to a quite different conclusion. For instance, there are a large number of car parks which are farmed shamelessly for penalty charges by the operators with no apparent car park management taking place. In such cases the lessons of Beavis would appear to be that the charge would be held to be a penalty in that case. In other cases, where the charge is for trespass and not breach of contract, the Beavis result comes down firmly in favour of the motorist. The POPLA Lead Assessor made it clear that whatever the Supreme Court verdict, the claimant must make their case and it would be the operator's responsibility to state how Beavis applied, if indeed it did. The Supreme Court also made it clear that the judgment was based on the use of the particular car park, and the clear wording of the notices, when they tweeted following the judgment. Indeed, even HHJ Moloney made this clear in his initial judgment. It is of course also a possibility that had ParkingEye been entirely truthful with the Supreme Court, had not produced false information and overly redacted evidence and had produced the true facts on which the court wrongly inferred then the judgment may have gone the other way. Therefore making a judgment on 4,000 stayed POPLA cases EVEN JUST ON THE ISSUE OF THE LEVEL OF CHARGE would not appear to be valid if the operator is not allowed to make their case on why Beavis applied, and the motorist allowed to make representations on why it does not. The Supreme Court, HHJ Moloney, ISPA, Motoring Organisations and The Prankster all believe each case must be heard on the facts. Only the BPA is in disagreement with this. The Prankster suggests that the next step should be to get a number of cases completely assessed, based only on the evidence currently filed by both parties. The Prankster can supply a large number of POPLA cases suitable for this assessment. If any of these cases can be decided for the motorist on non-GPEOL grounds, then all 4,000 cases should be fully assessed...or perhaps the BPA should just cut its losses by negotiating a fee to pay to the parking companies for each outstanding case. The dispute between Town and City Parking and Smart Parking has been settled. The verdict agreed between the two parties is that Town and City overvalued themselves by £1.2 million when they sold themselves to Smart Parking, and that no earn out payment is due. Thank you to Mr Mustard for this gem. A report in the Worksop Guardian has confimed that ParkingEye's system is driving shoppers away to rival establishments. I don’t shop in Worksop any more after my family were hit by two £100 fines for picking someone up. We now go to Meadowhall where it’s free and we don’t get pictures taken of us. It’s invasive and you have to mess around imputing your registration into the machine, which you will get fined for again if you get it wrong. It is clear that the system is not fit for purpose - there appears to be no genuine reason why a charge would be issued for picking someone up. This clearly indicates either the signs are deficient or the pay on exit system does not show the correct charge to be paid. Issuing charges for inputting a wrong registration is another trick used by the more disreputable end of the parking industry. Car park operators who offer a genuine parking management service have systems which detect when an incorrect number is entered, and help the motorist to enter a correct number. However, this greatly cuts down on the number of parking charges which can be issued. Parking companies such as ParkingEye rely entirely on income from parking charges and use systems which are hard to use and maximise the number of errors a motorist can make. The difference in management systems makes a huge amount to the number of charges issued. Freedom of Information requests show that managing a car park in a responsible way results in almost all motorists obeying the rules and so incurring no penalties. Conversely, farming car parks the ParkingEye way results in large numbers of charges being issued to the detriment of motorists, landowners and the general public. ParkingEye's talent at farming car parks to maximise the ability to issue parking charges allowed them to increase their profit from the £1.7 million reported to the Supreme Court in the Beavis case to £4.8 million the following year (£3.6 million if a pro-rata adjustment is made to take into account the 2014 period is 16 months not 12). This is an abysmal track record if you consider that truly successful car park management is to achieve full compliance without the need to issue charges and alienate your customers, driving them away to rival establishments. B&Q reportedly terminated ParkingEye's contract because they were driving so many customers away with aggressive enforcement. Once a new car park management company was installed, the customer base gradually returned. Not everyone agrees with The Prankster's analysis of course. The manager of the Priory Shopping Centre, David Aunins, has defended Parking Eye’s car parking management, which he says is ‘safe and secure’. It is not immediately clear to The Prankster why adding two ANPR cameras makes a car park either safe or secure, but perhaps if you are mugged while crossing the road at the exact moment a car is entering or exiting then the ANPR pictures can be used to catch your attacker. On the back of their Supreme Court win ParkingEye have issued a huge mailshot dredging up historic cases, many over two years old. The Prankster posbag is full of complaints and queries from motorists about these letters. The correspondence comes from Equita - both Equita and ParkingEye are controlled by Capita, so in essence this is a Capita-controlled exercise. 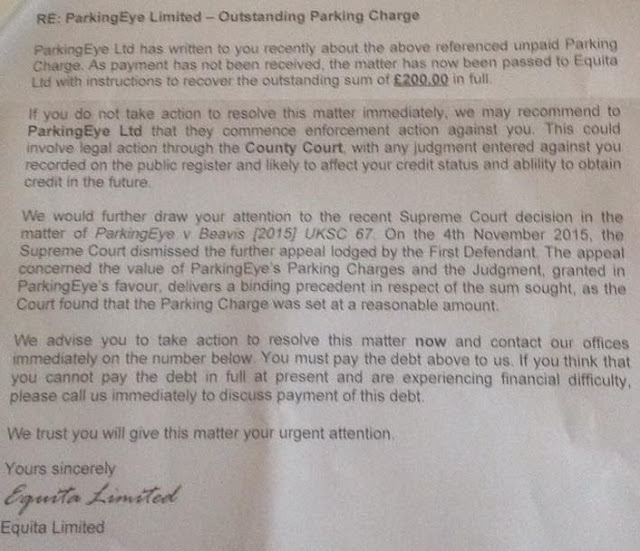 Although the Supreme Court found that a charge of £85 was valid, this is no longer enough for ParkingEye and they have over doubled this amount, issuing letters asking for £200. In all the letters The Prankster has seen the letters contain the false statement 'ParkingEye Ltd has written to you recently...' In most cases the last contact was two years ago. In some cases this is the first letter the keeper has ever received. 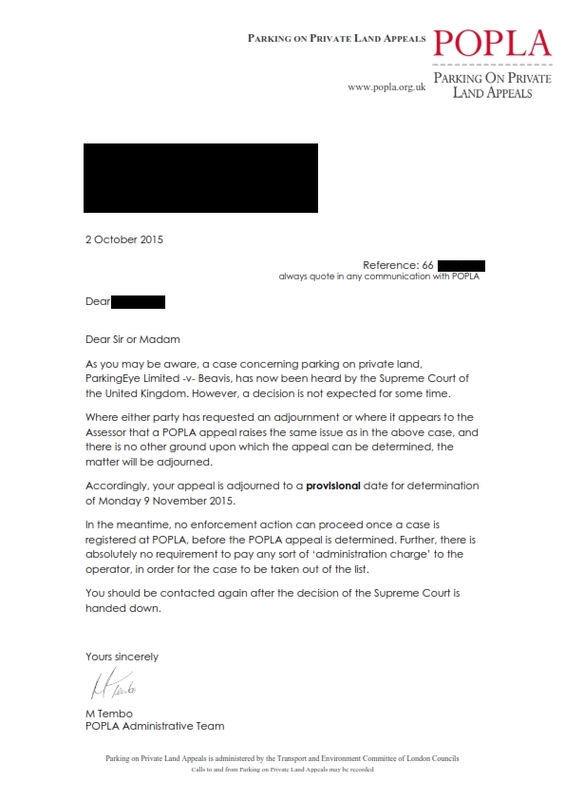 The letter also contains a misleading reference to the Supreme Court decision in ParkingEye v Beavis. Although this is a binding precedent, it is of course only binding where the facts and circumstances are similar. It certainly does not justify a charge of £200, and there are many other defences which may mean the parking charge does not apply. The Prankster therefore advises anyone disputing the charge to reply robustly to Equita. Debt Collection costs are therefore not appropriate and will be wasted costs. I am prepared to use alternative dispute resolution to attempt to settle this matter and suggest either POPLA or the Consumer Ombudsman are appropriate bodies. Please note that courts may apply sanctions if an offer of ADR is ignored or unreasonably refused. I will seek my full costs regardless of the eventual result if your client takes court action without first engaging in reasonable ADR. The debt is denied for the following reasons. Additionally, I have not received the letter you state ParkingEye sent to me recently. Please provide a copy of this letter together with the date sent. Please also provide a full breakdown of the £200 charge. Please note that the case of ParkingEye v Somerfield establishes that debt collection costs of around £60 are not allowable. Here is a report from a motorist who won this week against ParkingEye. This was during the period of bad weather. So we just came out of Court. ParkingEye didn’t turn up but had asked for an adjournment due to the weather and the floods in Cumbria. ParkingEye are based in Chorley and their advocate from LPC Law was traveling from Newcastle. The Court staff knew of people who had traveled from Newcastle without any problem and the Judge himself pointed out that he had traveled from Burnley that morning without even any delays - and so the case was dismissed. It is a win at the moment but not what I had in mind. Our defence shows that we were not in the car park when they said we were, and so the accuracy of the ANPR was questioned. We didn’t receive the “notice to keeper” but they said they could prove they sent it. The land owners as well as ParkingEye themselves were contacted to request what authority ParkingEye had to run this car park. In ParkingEye’s reply to our defence they did not show any proof at all of ANPR accuracy. They were unable to produce any proof of postage of for the Notice to Keeper. They did not provide any evidence whatsoever that they had permission to run the Snowdon Mountain Railway car park. The Law society frowns upon an advocate entering court if their name and qualifications were not forwarded to the Court before the case. I asked the Court staff if they had and the reply was that they had not. These would probably be good enough grounds to win the case even if ParkingEye had turned up - ParkingEye therefore saved themselves the cost of a lawyer from LPC Law (usually £150-£300). The Supreme Court case of ParkingEye Ltd v Beavis  UKSC 67 establishes that a Parking Charge for breach of contract of up to £85 may be allowable as a deterrent in some circumstances. To avoid over-eager judges striking out defences without properly reading them, it is advised that any defence against a parking charge raises other matters first. The charge is for breach but is not a genuine pre-estimate of loss. ParkingEye have not shown that in this car park they meet the criteria laid down in ParkingEye Ltd v Beavis  UKSC 67, and in particular that the charge is no greater than is necessary for deterrence. As this is binding case law, this case should be dismissed. MIL Collections Ltd are a debt collection company based in Truro. According to LinkedIn their MD is Alan Davies; Alan is also MD of Gleam Clean Service Ltd.
Alan is the sole shareholder, owning both shares in the company, having acquired the other share from his wife some time previously. MIL have a fairly poor reputation as debt collectors and a quick Google search turns up a large number of complaints regarding the tactics they use. Although they are members of the CSA, in The Pranksters opinion many of the tactics they use are against the CSA code of practice. Recently MIL have been buying old parking cases from parking companies for around £1 each, and have been attempting to monetise these by aggressively contacting the vehicle keeper and hugely inflating the cost. MIL move to court action as soon as possible, failing to follow practice directions for pre-action conduct. The idea appears to be that by filing a court claim either they scare the keeper into paying up, or the keeper fails to respond so they can get a default judgment.. The Prankster previously blogged about them in this blog entry. Of course, one reason that the monies were never paid is often that they were not owed in the first place. Some clever people in the parking and debt collection industries have realised that this is no barrier to making money. By filing court claims in bulk, enough people will be scared into paying up that a lucrative income stream is almost guaranteed. While it is easy and cheap to file a bogus claim in this way, it is very tricky for the man in the street to know how to fight this properly, or to unwind it if things have got as far as a default judgment. This week another MIL case made it to a county court hearing. The hearing took place in Manchester between MIL Collections and Dr S. Dr S was assisted by the British Motorists Protection Association with HO87 running the defence and preparing the documents, and John Wilke acting as lay representative. MIL Collections, smarting with their earlier court loss, decided to dispense with the services of their barrister. In fact, they even dispensed with the services of their own staff, not bothering to send anyone all the way from Truro to Manchester just to get a good spanking in court. The defence had a number of good arguments about champterous assignment of debt, but these were not specifically tested in court, the judge deciding to rule on easier points. The case was won due to failure to comply with Schedule 4 of POFA, the lack of a valid deed of assignment, no proof that the parking company had the right to issue tickets and no proof of the right to litigate. The judge made it clear that MIL Collection's case was wholly deficient and made even more hopeless as the evidence was served late and was not filed with the court. Additionally, when the judge was shown the evidence served he was of the view that it did not meet court requirements anyway. MIL Collections had not sought to excuse their non-attendance either. In the costs hearing, John Wilkie argued that as MIL Collections had neither turned up nor notified the court they caused court and the defendant's time to be unnecessarily wasted. The claim was entirely deficient, as outlined in the defence and witness statement, and had no chance of succeeding. Had the defendant known the claimant was not coming they could have had a paper based hearing. Because of their conduct and pursuing a wholly deficient and hopeless case ab initio it was entirely appropriate for a punitive costs order to be made, which would include Lay Representative costs. This would be under the 'unreasonable behaviour' provision (27.14.g) of the small claim track rules. John Wilkie pointed out DDJ Buckley's judgment in the Forgione case, which the judge was aware of. The judge hemmed and hawed and finally agreed. He ruled that pursuing a hopeless case, serving late, failing to file, failing to turn up and wasting court time was certainly unreasonable behaviour and awarded the full costs asked for, which were defendant's loss of earnings, travel, and the full lay representative expenses, all to be paid withing 14 days or enforced. The judge suggested a Third Party debt Order as MIL Collections had very kindly supplied their bank details, and Dr S agreed this was the best method for enforcement if required. It does appear that the courts are not happy with being used as speculative debt collectors by the likes of MIL Collections, Civil Enforcement Limited and a few others, and that word is going around the circuit. Buying the speculative debt off the parking company for one pound did not turn out to be the bargain MIL Collections were hoping for, and they are now several hundred pounds worse off. Sadly many vulnerable people in similar cases will be tempted to cave in due to the bullying tactics of MIL Collections, and the fear that the debt may escalate. This will mean MIL only need to get paid for more cases than they lose to make the exercise profitable for them. The Prankster advises people not to be a victim and to robustly defend themselves, following the procedures laid down by the courts and making it clear to MIL Collections they will be asking for punitive costs if the case gets as far as a hearing. The Prankster will leave you with this linked-in endorsement of Alan Davis from his ex-colleague David West. 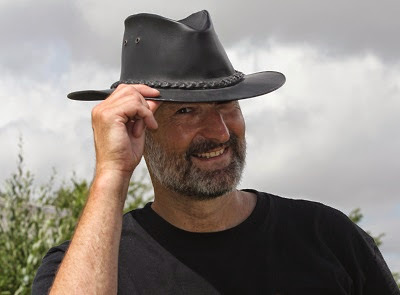 "Alan is one of the most generous people I have ever met and knows the debt industry inside out"
For someone who knows the debt industry inside out it does seem surprising so many basic errors were made regarding debt assignment and court procedure. A motorist has reported their vehicle was keyed while parked at home following their appeal of a parking charge from a private parking company. This may of course be a co-incidence, and may be the result of a rogue warden angry at not getting their bonus. However, if this has happened to you, please contact The Prankster at prankster@parking-prankster.com with evidence of the keying, the parking charge and the appeal. If a pattern emerges, this can then be taken further with the appropriate bodies.